Mate ... I love you, mate. There. I've said it. “Brian is a freak. He created a pretty painful result for us at Croke Park a couple of years ago when he scored under the posts to draw the game. He’s achieved so much. All of us in the Aussie camp respect him so much. On a good day he’s one of the best in the world. We’re hoping he has a quiet night on Saturday. Absolutely he represents the same threat that he did five years ago. Players like Brian turn up in arenas like this. It’s a World Cup and he’s here to play. Back in 2002 I was told by my coach to study Brian O’Driscoll because he was the best at what he did at 13. He had acceleration and defence – he’s a complete player and has shown that for that last 12 years. AAC is a pretty sharp player in his own right, whether he’s played in the centre, on the wing or at fullback. He’s had a bit of a slump this season, but the guy is a quality operator and brings waaay more to the team than Anthony Faainga, who wore the No13 jersey in the game against Italy. With Ioane injured, the Australian backline will see some changes. If hot-tempered larrikin James O’Connor is seen as a straight swap in for the hurt Queenslander in the No11 jersey, the uninspiring Aussie centre partnership of grey man Pat McCabe and Faainga will live to fight another day. If, on the other hand, Shmoo Mitchell is risked in his first game back, we could see HTLJOC restored to the right wing and AAC move in one step to the No13 jersey, with Faainga demoted to the bench. Maybe this decision has already been made, and is the reason why AAC is talking about Drico – i.e. because they’ll be opposite numbers on Saturday. Or maybe not, and it’s just because he really, really loves him. 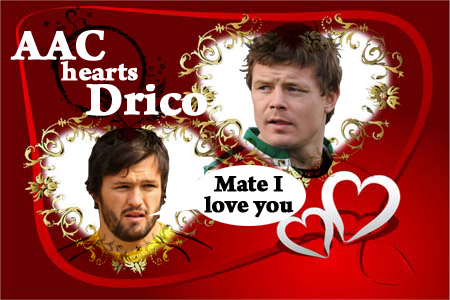 This entry was posted in RWC 2011 and tagged Adam Ashley Cooper, Australia, Brian O'Driscoll, I choo-choo-choose you – and it's got a picture of a train on it, Ireland by dementedmole. Bookmark the permalink.